Synthetic Polyglycols (High Temperature) There are 7 products. Oliol 68 is a 100% synthetic high-performance oils based on polyalkylene glycol, specially designed to withstand extreme lubrication conditions and long service life. Oliol 100 is a 100% synthetic high-performance oils based on polyalkylene glycol, specially designed to withstand extreme lubrication conditions and long service life. 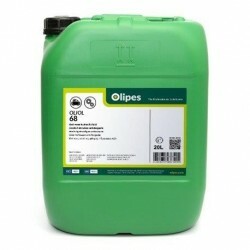 Oliol 150 is a 100% synthetic high-performance oils based on polyalkylene glycol, specially designed to withstand extreme lubrication conditions and long service life. Oliol 220 is a 100% synthetic high-performance oils based on polyalkylene glycol, specially designed to withstand extreme lubrication conditions and long service life. Oliol 320 is a 100% synthetic high-performance oils based on polyalkylene glycol, specially designed to withstand extreme lubrication conditions and long service life. Oliol 460 is a 100% synthetic high-performance oils based on polyalkylene glycol, specially designed to withstand extreme lubrication conditions and long service life. Oliol 680 is a 100% synthetic high-performance oils based on polyalkylene glycol, specially designed to withstand extreme lubrication conditions and long service life.